Loading the cargo on Neva river in St.Petersburg. Source: Power Machines Corp.
Russian FESCO Transportation Group delivers two giant hydraulic turbine wheels manufactured by the Leningrad Metal Factory in St. Petersburg (part of the Power Machines Corporation) to the Krasnoyarsk hydroelectric power plant via the Northern Sea Route. Weighing 244 tons each and measuring 8.5m in diameter, these are the largest radial-axial wheels in Russia ever produced at this factory by Power Machines, Russian leading power engineering company specializing in turn-key projects in the electrical power field. 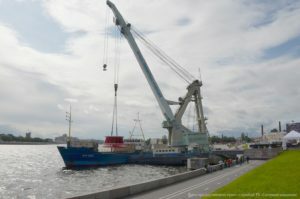 According to FESCO press service, on August 26, a floating crane loaded the heavy cargo first to the crane’s pontoon and then onto the river/sea vessel which will pass through the White Sea – Baltic Sea Channel northbound to the White Sea, thereafter will go by the Northern Sea Route to the river Yenisei and then about 2500 km by the river down to Krasnoyarsk. After discharging at Krasnoyarsk, the massive units will be delivered by modular trailers to the hydro power plant. FESCO expects the whole transportation to be concluded within 30 days. Additionally, the company will provide inland transportation of 160 tons of auxiliary equipment. The complicated logistics project demanded a thorough preparation. FESCO experts have worked out an integrated technological scheme of multimodal transportation including unique methods of cargo loading and unloading at berths without specialized equipment. Besides, the quay area at the dispatch point which is located at the embankment of the Neva practically in the centre of St. Petersburg, had to be reinforced and leveled out, prior to the loading operation. Also, the Neva river bed mapping was conducted to ensure safe docking of the vessel.